Chateau / Country House5500 sq. ft. The manor has 7 bedrooms and sleeps up to 16 people. We welcome weekend and short break guests please see our own webpage or enquire for rates. Located only 20 minutes from Bristol, 30 minutes from Cardiff, and 35 minutes from the ancient roman town of Bath. It is the perfect location for touring both England and Wales. Llanthony Manor is located on the southern tip of the Wye-Valley, which is an area designated for its outstanding natural beauty. The Manor is only 100 yards from the Norman Castle at Caldicot with its 55-acre country park. Located in a quiet village and surrounded on three sides by a high stone makes this an amazing place to relax and enjoy life. The Medieval Manor exudes an inner warmth, and unique charm. Lavishly furnished with antiques this unique opportunity to enjoy life in a medieval manor should not be missed. The manor is a special place but is very much an ancient farmhouse, we welcome groups with children and pets. The Medieval Manor is located on the southern tip of the Wye-Valley, which is an area designated for its outstanding natural beauty. The manor is only 100 yards from the Norman Castle at Caldicot with its 55-acre country park. 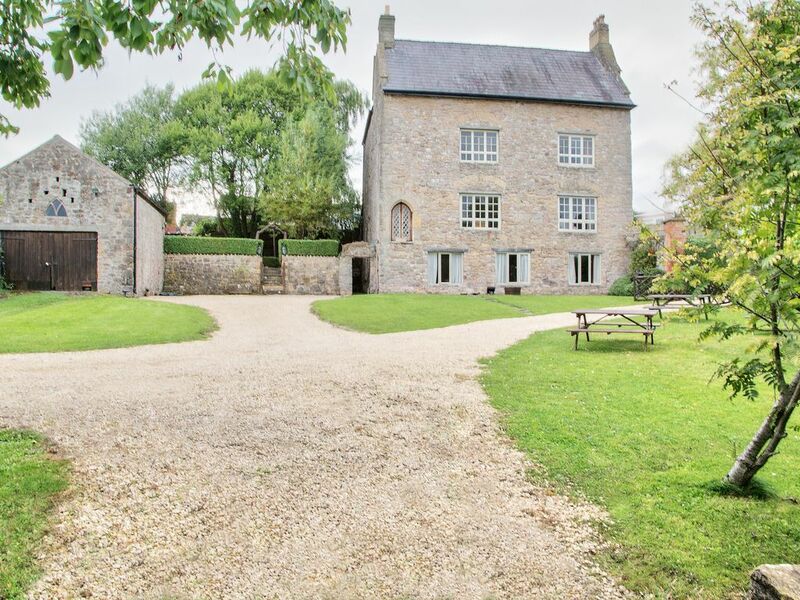 Located in a quiet village and surrounded on 3 sides by a high stone wall, exclusive use of the large garden. On the borders of England and Wales you are perfectly placed for touring both countries. Less than an hours drive to: Hay-on-Wye, Bath, Bristol, Cardiff, Gloucester, Cheltenham, Tetbury, Monmouth, Brecon and the Cotswolds. All of which have a unique individual character and will inspire and entertain travellers. Services: We can put you in touch with private caterers or for those who would rather dine out the local castle pub is just 100 yards away. There are many restaurants in the area to choose from each offering a unique blend of traditional values and exceptionally elegant creations. You can enjoy the finest food and superb wines all while enjoying the breathtaking views of the Wye and Usk valleys. We can also arrange for additional cleaning services during your stay as well put you in touch with caterers and various event and entertainment companies. Please note we do not normally start bookings on Saturdays or Sundays. The manor is an amazing house, and I don't think there is another property so old in the country that can be rented. You really are experiencing history when you stay here. It's a very special property and I've always been happy to share it with the public as I believe these places should be enjoyed and appreciated so that they can be maintained for future generations. The bathrooms both have a claw and foot roll top baths and showers. The manor is very warm it is heated by two separate boilers. American Fridge/freezer and under counter refrigerator. The great hall seats 20. Four poster beds, ancient stone walls, bread ovens and an incredible amount of original medieval features are just a few of the things you will enjoy at the manor. The manor has full gas central heating run on two separate systems so this is always plenty of hot water. All rooms have one or more radiators with thermostatic valves so that guests will always be comfortable. There are two period kitchens with easy to use electric range cooker. Modern appliance include an fridge, freezer, dishwasher, microwave, blender, toaster, kettle and automatic coffee maker. All our towels are of the highest quality and we only use designer sheets and covers on all our beds. We ensure that we provide only the highest standards and understand the discerning clientele would expect nothing less. The great hall has a dining table that seats up to 20 guests. The manor also has an L1 smoke alarm system as the safety of our guests is most important. Booked the Manor for the whole family to celebrate my mum’s 60th. The whole process was very user friendly and the owner and housekeeper were brilliant. Thoroughly enjoyed our stay; plenty to do in the surrounding area and the Manor itself was lovely. The children all had a great time and enjoyed the medieval style of the accommodation; I would definitely recommend. Very handy being able to take along the pets as well. Lots of space for our crowd of 12. It was a real experience in a beautiful, character filled home! Great kitchen, furnished beautifully with great bathrooms and plenty of hot water. Mattresses and pillows could be better in some of the rooms. I stayed at this 800 year old manor house and had an amazing time! The house had all the modern comforts you would expect in today's age, but still kept all the charm of a Medieval dwelling. The host Becky was very responsive and we are very thankful accommodating our myriad of questions without fuss. She even helped arrange for the cleaner to accept shopping and put it in the fridge before we arrived, which is something small but makes a huge difference. Would stay here again given the opportunity. Thanks so much for taking the time to leave a review. I'm so glad you enjoyed your weekend. It was a pleasure having you stay and perhaps we will see you again in the future. The house exceeded expectation! On approach we could not believe it was as good in real life as it was in the pictures! The whole family were blown away. The house space lent itself to people sitting together and chatting and playing games. It also encourages group meals on the amazing long table where we stayed for hours reminiscing and sharing jokes and stories. This is a house which we will have very fond memories of as we joined together to celebrate a very special birthday. Impressive old house - full of character. Kitchen could be better equiped with smaller items eg enough dessert spoons for everyone to eat at the same time ( there were only 9), some serving spoons and serving bowls etc. Garden a little dissapointing and the "play house" full of clutter - but non the less we had a good time and feel that the character of the house added a lot. Grandson especially liked the long dinner table which he thought like in Harry Potter! Thank you for leaving a review. I'm glad you enjoyed your stay. Its always difficult for us to check everything in the late summer and on this occasion we didn't see the missing spoons or check the playhouse. We do listen however and always act on feedback. I have personally added 24 desert spoons to the kitchen and asked the grounds keeper to clean out the children's playhouse. A very special place for a very special occasion.We were able to accommodate all of our family (14) from several ares of the UK, Australia and China! The unique historical character of the Manor with stone walls, wooden beams, spiral stairs and four poster beds fascinated the family especially the children. The large banqueting table and kitchen facilities and friendly local caterers provided a memorable celebration meal. Spacious gardens permitted family games in the good weather we enjoyed. although garden chairs as well as picnic tables would have been helpful. The Castle and Country park in Caldicot and proximity to motorways and Chepstow enable us to explore the scenery and history of the Wye Valley, Forest of Dean and as far afield as Llantwyth Major coast. Thank you for enabling us to have such a memorable week. Thank you so much for taking the time to leave a review. It was a pleasure having your family stay. Located in the Wye Valley and area designated for its outstanding natural beauty. On the borders of England and Wales you are perfectly placed for touring both countries. Less then a hours drive to: Hay-on-Wye, Bath, Bristol, Cardiff, Gloucester, Tetbury, Monmouth and Brecon being some of the local tourist hot spots. All of which have a unique individual character and will inspire and entertain travellers. There is also a large amount of castles, golf courses, shopping, fishing, museums, hiking, climbing, the list is endless. With more than enough to keep you occupied. We do not normally start bookings on Saturday or Sunday but you are welcome to choose any weekday to arrive.